I had an incredible time at Los Angeles Gay Pride on Sunday! I got to meet the other amazing honorees – including Johnny Weir and Andy Cohen, both gorgeous and fun! Andy lost his phone (that is the worst). Hopefully he found it. I rode in the car with Scott Silverman and John Roberts in his mom wig. We kiki’d the whole way (drag queen terminology for gossiping behind your hands) and laughed our heads off. 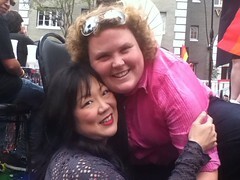 There were lots of highlights like getting to talk to Fortune Feimster who I absolutely want to adopt! She is so adorable. I was humbled when Mayor John Duran declared June 12th “Margaret Cho Day” in West Hollywood – seriously, what an honor! Also, I got to see many old friends, which for me is what Pride is mostly about – reconnecting with everyone after being away. And the best part was watching the CHO HOs in action! These great people marched with me and even had a dance! I love the CHO HOs! I am eternally grateful! Happy Pride Season! ps. by popular demand, we have now made the CHO HO tanks available for a limited time in my shop! Cho Ho Dance – LA Pride 2011 from Margaret Cho on Vimeo. Thank you so much for the chance to walk with you in the parade! It was such an amazing experience. You have been such a great inspiration to me. As a Japanese American, lesbian, girl who grew up looking nothing like the cute, skinny, fair skinned, “beautiful people”…I really pulled a lot from you as a role model. Thank you for all that you do. You have given me strength to accept myself the way I am and I no longer feel alone. ChoHo for life! Cho, you get better looking as you get older and you were really cute when you were starting your career. I saw you in Houston a a comedy club a few years ago and you are a real expert at standup. I enjoyed every minute. Congratulations with such longevity. I have, of course, loved EVERYTHING Cho for many years. And as a great fan I know how much you are admired in the LGBT community. But it was so incredibly moving to see and hear just how much you are really and truly loved! 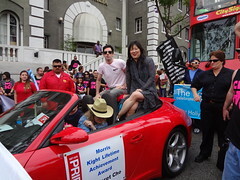 All along the parade route I heard comments like “Oh, Margaret Cho, I LOVE her!” and “She’s fantastic!”. People fought for position to take your picture and would return holding up cameras and/or cell phones and shouting “I got it! I got it! I got a picture of Margaret!” and smiling from ear to ear. I was also moved to tears by more than a few people, (mostly gay men), who approached you to tell you how you had made a difference in their lives through your support and action on behalf of the gay community. I heard one guy comment to a friend that if it hadn’t been for you he probably would have committed suicide. That is heavy stuff, man and a testament to your unfailing support of the LGBT community everywhere. I had a blast being your Cho Ho and I’d do it again anytime anywhere. Thank you for the opportunity! And thanks for the Cho Ho shirt and Cho Dependent bag. I had people offering to buy the shirt right off my back! Your staff/crew was awesome! A great bunch!